Seating: None but temporary uncovered seating can be installed if necessary. The track was originally called an all weather purpose track but was actually made from could best be described as stonedust and had to be rolled so was effectively a "cinder" track. The Island Government agreed to upgrade it to synthetic after the track turned into a mudbath when it started raining during the 1987 Island Games and thus caused much embarrassment. The synthetic track officially opened in January 1994 although had been in use since September 1993. The track was resurfaced in autumn 2001. Construction started in summer 2002 of a 600 seat covered stand alongside the home straight of the track which will be on rails so that it can brought close to the finish for athletics and more central for team sports played in the infield. This meant that the runways outside the home straight have been resited. The stand will incorporate changing and function rooms. Guernsey is hosting the 2003 Island Games and the track would then become the 'National Stadium' and used as a centre piece for the 2003 Island Games and also subsequently for other major sporting events such as football finals. The stand is expected to be completed in March 2003. The track is adjacent to an Astroturf hockey pitch and a new pavilion for this is being built near the 1500m start overlooking the pitch. The track is shown in cell F3 on the Visit Guernsey website. The track is the white cell almost in the centre of the map to the right of the road running North-South. 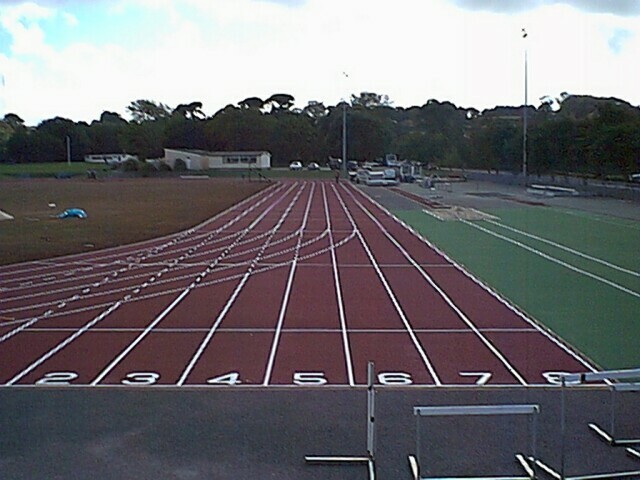 Any correspondence regarding the track should be sent to Beau Sejour Centre, Amherst, ST. PETER PORT, Guernsey, GY1 2DL. The diagram of the track prior to 2001 is here.